I am one of the living proof that Sulit.com.ph is the #1 Online Classified Ads in the Philippines and the most trusted, too when it comes to buy and sell industry. Let me share to you how I found Sulit.com.ph. Last year, my husband and I planned to buy a second-hand car, when we already have the budget, of course, we were itching to ride our own “baby”, so we looked literally “everywhere”. Almost every day, we bought several types of classified ads newspapers and even resorted to have a peek at a car finder. The only problem with these is that there is no photo of the cars being sold so it was difficult fot us to find the “perfect one”. There was this one car that we saw (the description) in the car finder which was available near my cousin’s place, so we went to my cousin to ask help in finding that place. When we saw the car that was advertised in the car finder, I was dismayed because it’s not that “good” as described. So, we went back to my cousin’s place for chitchat and before we entered his house, I just saw a red car parked just outside the gate. Obviously, I didn’t ask if that car was for sale because even if it was, I know I can’t afford it based on the car’s “appearance”. But honestly, I was struck by the “love at first sight” thing with that red car. Unfortunately, my husband and I went home without a car…yet. 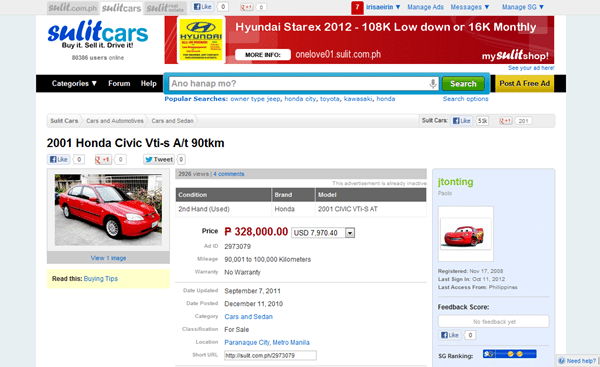 Because of that red car, I already have an idea of what I will look for when I search for cars for sale online. Naturally, that’s what I did when we got home; I immediately opened our computer, connect to the internet and painstakingly googled for an affordable second hand red car but definitely in good running condition. That’s when I landed at Sulit.com.ph. 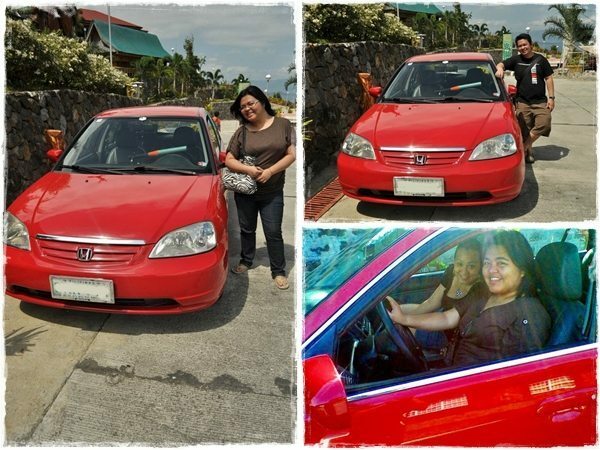 Browsing the site’s wide collection of cars for sale, I was really surprised that the red car I saw at my cousin’s place was the one I was looking at being for sale at Sulit! Was it really destiny? Amazing, isn’t it? You may think I am making this up, but honest to God, this is true! What’s more unbelievable is that, the price was not as “high” as I expected and our budget fitted! Of course, I called Monch, my husband, to let him see the car, and he, too, was unbelievably astonished! Despite the excitement, we still checked for other important details about the car and we learned that it was a 2001 Honda Civic car. In addition, we also checked for the authenticity of the seller through Sulit’s Seller Feedback and Sulit Check, wherein prospected buyers can check how the dealer/seller is trusted by other buyers that they have made transactions with. Again, to make the long story short, we made the “deal” and bought the red 2001 Honda Civic car! It’s really in good condition and until now, I seldom experience problems using it! I’m just glad I discovered Sulit.com.ph. Another interesting fact is that, I am also a Sulit member for years now because I also sell my KSA products in Sulit.com.ph, as well as, advertised the Bus For Rent service offered by my cousin; so far, I encountered no problem with the transactions or deals made between me and the buyers/customers through Sulit. The Sulit.com.ph is a team of dynamic, talented, and technologically-driven individuals who share a common interest in innovating resourceful solutions from modern ideas so as to provide Filipinos the business opportunities they deserve, thus helping them become successful on their chosen industry. 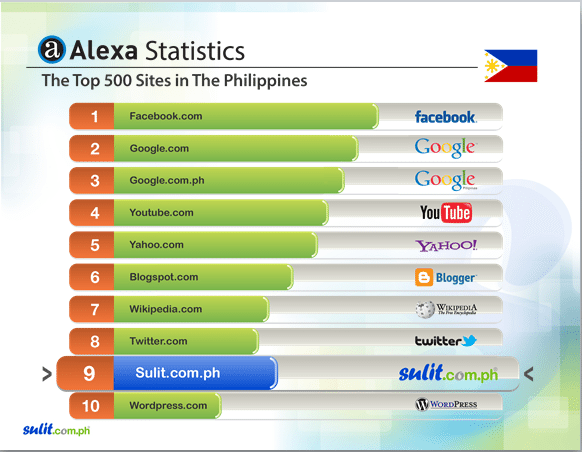 Maybe this is the reason why Sulit.com.ph has been included in the Top 10 sites in the Philippines, not to mention that it is the only website listed in Top 10, which is locally based! Not just that, sulit.com.ph also sponsors charity events to reach out to those who are in need. Likewise it started the Sulit Netrepreneur Academy, which aims to hone the netrepreneurial skills of the Filipinos to help them become successful in business. Moreover, they also host events, like the Sulit Clique. Their aim is to let everyone know how people can benefit from sulit.com.ph and the latest about the website. Actually, earlier this evening, the largest gathering of Sulitizens happened at Eastwood Central Plaza. The event was hosted by Jessica Mendoza & Tyler Ramos with special participation of Lourd De Veyra, Sulit.com.ph’s brand ambassador. Up Dharma Down, Yolanda Moon, Hidden Nikki & Maude also graced the event with their performances. Wait there’s more!!! 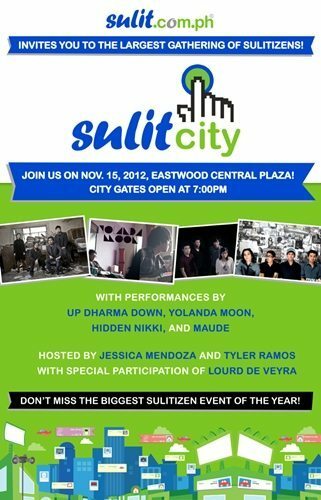 Sulit always comes-up with new and exciting promos for all Sulitizens! Who can forget their Sulit Ang Hanap Mo promo? Sulit.com.ph gave away iPads, Samsung Galaxy S III and a brand new 2012 Honda City. How cool is that? Sulit.com.ph is a Filipino e-Commerce Company that aims to provide opportunities to every Filipino as well as, to help enrich people’s lives through technology and innovation. The team visualizes of becoming the leader in e-Commerce in terms of Market Share & Financial Performance, Quality of Service and Social Responsibility, among others by valuing Teamwork, Respect and Integrity, together with innovation. RJ David started Sulit as an experimental free online classified ads website last September 11, 2006, this date (9/11) was chosen so as to easily remember the date. It is an acronym for “SUper Low Internet Trading“. Actually, RJ, who acted as the web developer/architect was with and Arianne, who was the web designer and test engineer, when they launched Sulit.com.ph. 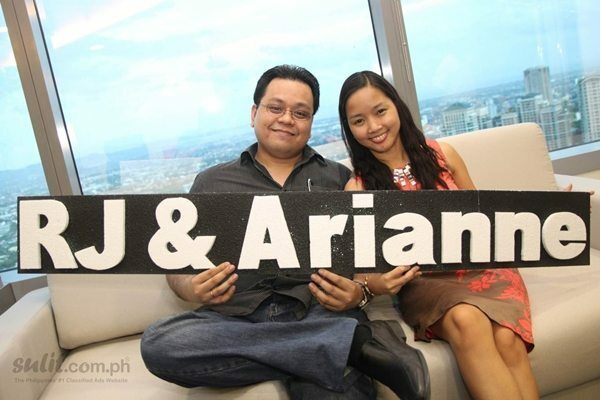 Months after, because of the success of the “experiment” and the positive result, RJ and Arianne decided to register a sole-proprietorship entity under the name Netrepreneur Connections Web Services or NetCon in April 17, 2007; “Netrepreneur” Sulit connects trough Internet Entrepreneurs. What are the features of Sulit.com.ph? In order to make their service take one step further, they launched their latest campaign tagged as Ano Hanap Mo?… Hanap.Usap.Deal, it lets every Filipino know that everything you’re looking for can be found in sulit.com.ph from apparels, gadgets, cars and many more! Finding something in Sulit is easy because the image of the item being sold is posted. When you found what you’re looking for, just contact the seller and make the deal! Easy, right? So what are you going to get from Sulit.com.ph? A LOT!!! 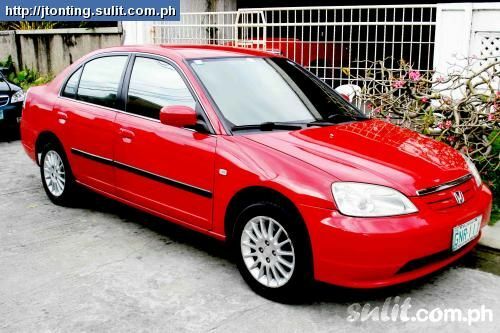 http://cars.sulit.com.ph/ – Sulit Cars is your buy and sell portal for cars in the Philippines. http://realestate.sulit.com.ph/ – Bringing together the majority of top and trusted sellers, Sulit Real Estate is your online partner in finding the best properties in the Philippines. I am a huge fan of Sulit too! 🙂 I have used it several times in looking for suppliers, as well as when we had to look for apartments to rent. Sulit is definitely easy to use, and a very clean interface to match. Hi Sammy, my fellow Sulitizen! 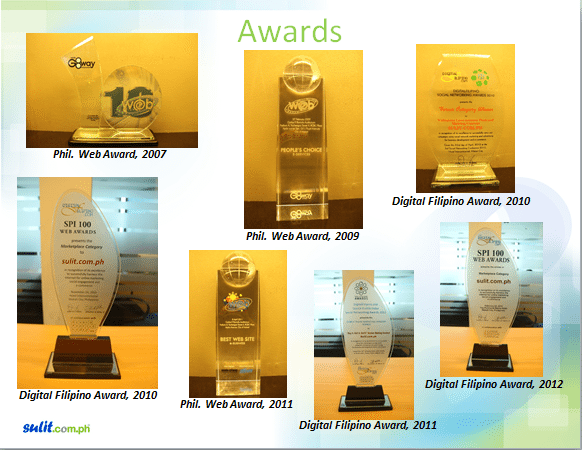 What I love about sulit is their continuous improvement process. Recently, they launched their wew website feature which is the Location-specific Homepage. This update allows you to automatically filter ads that are within your choice of location. Ngayon ko lng nalaman na ang Sulit ay acronym ng SUper Low Internet Trading. anggaling. I’ve heard about Sulit but I didn’t know that’s where you bought your car. Simula ngayon, dyan na nga ako maghahanap pag may kailangan ako. correct levy! tapos sa print classified ads, puro naghahanap ng textmates makikita mo hahahaha! tsaka scarry din, kasi walang feedback system sa print. mamaya scammer pla makontak mo. Thanks to Sulit because it makes buying and selling so easy. The feedback system really helps. agrees! 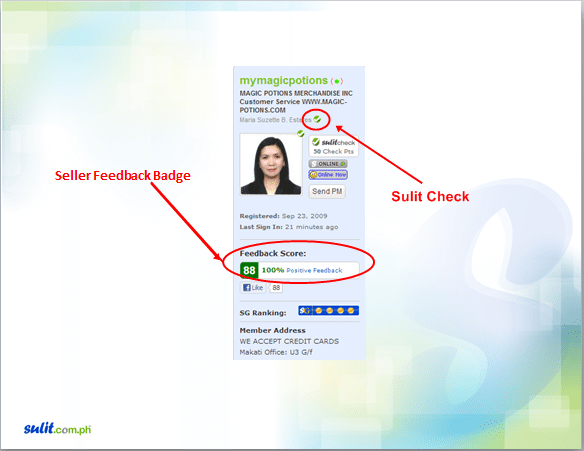 Sulit’s feedback system is a great defense against those fraudulent sellers! madalas din ako tumingin sa Sulit pero wala pa ako nabibili gamit ang hi-tech na classified na yan 🙂 gusto ko yung tagline nila Hanap, Usap, Deal! While I was reading the comics, I could hear in my mind exactly how you two would have said those lines. LOL! About Sulit, I’ve never really tried buying anything through it but my hubby has made transactions several times already. Mostly buying accessories for his bike and his car. So far, he hasn’t had any negative experience using Sulit. hahaha! Olga natatawa pa rin ako until now pag naalala ko ung scenario na yun. it took him almost 2 to 3 hours para makakita ng magandang deal sa print classified ads, and nung pagcheck namin nung car, sobrang disappointed kami. Sulit is also a big help to our company. This is where we advertise the products and services that we offer. One of the nicest parts of this site is the feedback portion from the clients. So there you can see the two sides – seller’s information and feedback from their previous clients. I hope Sulit will continue its mission of being a transparent and trustworthy marketplace. oooh, yan pala ang kwento ni rose. ok ah. i’m also a sulit member and have bought and availed services from various sellers. so far, no bad experience. sa sulit pala galing si Rosa!